Robert Bly Is The Poet Of Minnesota, Vietnam And Mythical Men Robert Bly is probably best known for his controversial nonfiction book Iron John. But as a poet, he's conjured deeply resonant imagery of nature and war for 60 years, as his Collected Poems reveal. 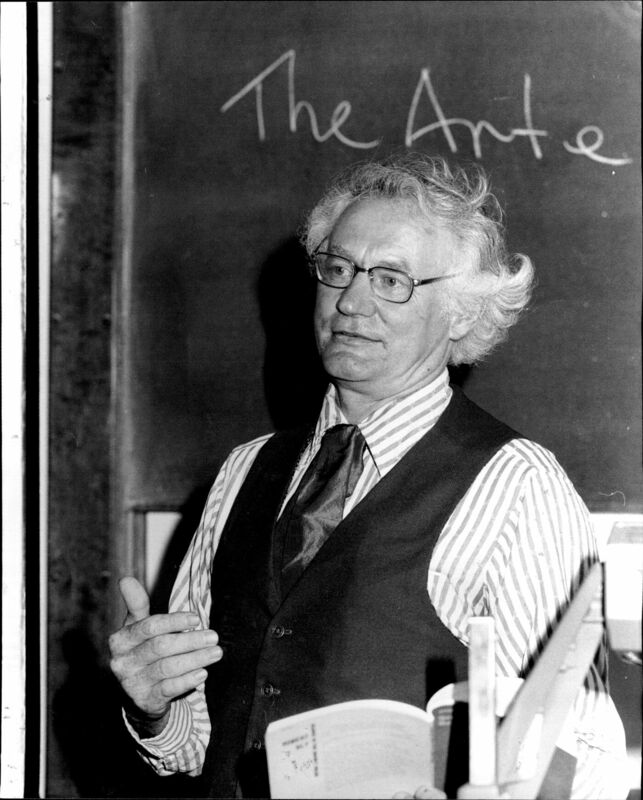 Robert Bly, pictured here in 1980, is known as the chief proponent of the Men's Movement of the 1990s. But in the poetry world, he's known for emotionally charged work about nature, the Vietnam War and personal unburdening. For more than 60 years, poet Robert Bly has written about nature, mysticism and political protest. His two dozen collections have garnered many prizes, including a National Book Award. Now all of Bly's poetry has been reissued in a single volume – his Collected Poems. Like many mid-century American poets, Robert Bly started out writing rhymed verse in iambic pentameter — five rhythmic beats to the line — in the centuries-old Western tradition. Bly will turn 92 this month, and doesn't do interviews anymore. But in 1986, he said that he came to feel that the melodic style of his earliest work was fine for a Shakespeare or a Milton — but wrong for the world we live in. "Now Robert Frost was able to do it," Bly said. "But he was born in 1875. And so it just isn't clear if these wonderful melodies of iambic can be adapted to American material — I don't know. I'm interested in form now, but I'm not so interested in repeating English form." So Bly changed the form of his poetry: He began to write in unrhymed free verse. He also changed his subject. Bly lived in rural Minnesota for much of his life, and many of his poems are set in that region — especially in his 1962 debut collection, Silence in the Snowy Fields. As the '60s progressed, he started writing about the grief of the nation at the time of tumultuous anti-war and civil rights protests. His 1967 collection The Light Around the Body won the National Book Award. Critic James Longenbach calls it Bly's most important book. "You feel him trying to use those words in a way that evokes something much larger and more mysterious or mythic than their literal meanings suggest," Longenbach says. Longenbach, the author of How Poems Get Made, says Bly will forever be associated with organizing the music of the English language in a way called "Deep Image." "What that phrase refers to was a way of writing poems that came in the early '60s, late '50s out of Bly and a few other people that tried to reduce poetry to ... images that were deeply redolent of deep psychic or cultural power," he says. Eight hundred steel pellets fly through the vegetable walls. After the war ended, Bly's poetry shifted inward, from the political to the personal. "I became in touch with my own anger in a way through doing the Vietnam poems which I never expressed my anger privately," Bly said. "It wasn't done in my family." Robert Bly grew up in Western Minnesota in a family descended from stoic Norwegian immigrant farmers. Bly says he experienced "a recovery of feeling." "Certain emotions are coming out that maybe I have kept in," he said. "My father being alcoholic, from an alcoholic family, we tend to repress a lot. Try to be overly cheerful. I see this stuff coming out, it helps me tremendously." That introspection led to Bly's most famous book — a nonfiction work called Iron John: A Book About Men. Published in 1990, it became an international bestseller and sparked what became known as "The Men's Movement" — based on the idea that men need to be more sensitive. "I mean, when I saw the Republican senators up there, attacking Anita Hill in that insane, bitter, heartless way, I said, 'Man, that's the greatest argument for a Men's Movement I have ever seen,'" he said. James Longenbach says Bly's role as a founder of the Men's Movement hurt his reputation as a poet: "Because it allowed people who found that distasteful to dismiss him rather easily," he said. But Bly continued to write. Sensitivity is a big factor in his later work — he wrote poems that feature a Zen-like focus on an object in nature, with what Bly calls the "intensity of being right there." "I'm doing one, for example, on opening an orange," Bly said. "What's it like when the 10 fingers meet and decide to open an orange? And the two thumbs go in first and start to break it, hmm? Then the other fingers hover around and wonder if they can't help with this. And pretty soon the whole orange is lying there naked and scarred. Naked. And that's a little embarrassing. So therefore they think the best thing to do for the modesty of the orange really is to eat it." Robert Bly says it's a disaster in our culture that poetry is taught on the page when it needs to be spoken aloud. In his words, poetry should "run through the brain and down into the heart."